Responsive webdesign is a de-facto standard in the modern web now. We usually design websites with both small and big screens in mind. However, we often stop when it comes to embedded images. In most cases, there will be one image file that is (kind of) optimized for desktop usage, which will then be used across all screen sizes. We can do better with responsive images. If properly configured, responsive images are clearly a win-win feature: Users like fast, mobile-friendly websites and website owners like satisfied users. How do responsive images work? Ask two web developers what responsive images are and you get three opinions. The good news is that, while the response to this question was quite complicated a few years ago, nowadays it should be straightforward. The HTML5 standard specifies three new features to implement responsive images in modern web browsers. Actually, the browser support is pretty good, which is why responsive images should be a nobrainer. And for older browsers, there is a polyfill for responsive images called picturefill. With the srcset attribute you can provide additional image files to the browser. These files have to show the identical image and should only vary in their dimensions. This is important because the browser is free to choose which image will be used in the current environment. While current browsers base their decision mainly on the current viewport size and the pixel density of the screen, this may change in the future. Thus, you cannot use srcset to define which exact file will be used on a specific device! The following example defines an image with three additional image files, one 400 pixels, one 800 pixels and one 1200 pixels wide. The sizes attribute gives the browser hints about what image should be used in the current environment. Without a sizes attribute, the browser doesn’t know in which size the image will be displayed on the page and can’t decide intelligently which image file should be downloaded. If the viewport width is larger than 800 pixels, this image tag will be 800 pixels wide. If the viewport is less wide, the image tag will fill the whole viewport width. Thus, the 1200w file will only be used on high dpi screens. Last but not least, there is the <picture> tag. Apart from some other useful features, picture allows something called art direction. This means that you can provide different images based on CSS media queries – usually the viewport width. This is exactly the feature srcset can’t provide: To force the browser to load a specific image at a defined breakpoint. As you might have guessed, both srcset and sizes can be used for each <source> tag, which makes the <picture> tag both powerful and complex. What changed with TYPO3 8.7? These crop variants can be defined either in TCA or in Page TSconfig, as described in the feature documentations linked above. How to render responsive images? While these changes are all nice and fine, what is missing in TYPO3 8.7 is a way to render those images in the frontend in a convenient way. This is why we at sitegeist developed an extension called sms_responsive_images. It contains the necessary Fluid ViewHelpers to render both <img> tags with srcset/sizes and whole <picture> tags. It also tweaks the rendering of fluid_styled_content to generate responsive images by default, so your content images get upgraded to responsive images automatically. The following snippet would generate the <img> tag with srcset and sizes I used in the example above. This serves two purposes: It sets a reasonable default width for the fallback image (otherwise it would be the original image size) and it generates a sizes query based on the specified width. For mobile screens under 600 pixels, it would choose one of the mobile@ images based on the viewport width and pixel density of the screen. For desktop screens above 600 pixels, it would choose one of the desktop@ images. If the viewport width is smaller than 800 pixels, it will choose based on the whole viewport width. If it’s larger, 800 pixels will be the maximum width. 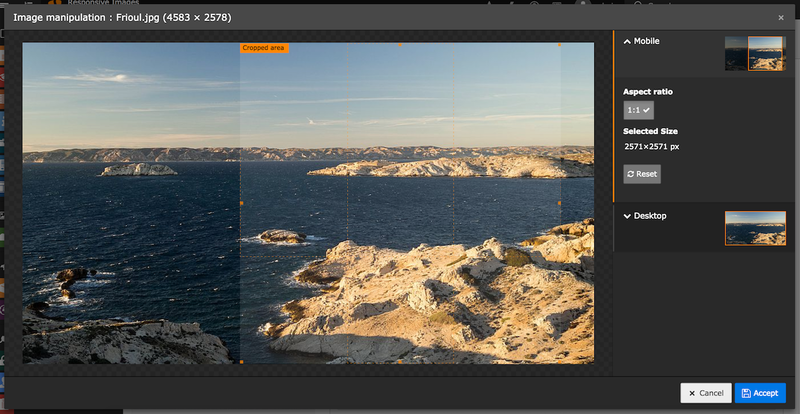 A screen at 1000px viewport width and a pixel density of 2 would likely display desktop@1600.jpg. A screen at 400px viewport width and a pixel density of 1.5 would likely display mobile@600.jpg. How can I get this? I really hope that this extension will help to spread the usage of responsive images in the TYPO3 community. With images being the largest files on most websites (apart from audio/video of course) and always increasing mobile usage of the world wide web, it should be a goal for all of us to serve the user the fastest loading and smallest possible website while still having great image quality. And we can achieve that with responsive images. eine super Extension. Habt ihr schon eine Roadmap für die Aktualsierung auf TYPO3 9? Danke für das Lob. 🙂 Die aktuelle Version der Extension ist bereits mit TYPO3 9.5 kompatibel. Du kannst sie entweder im TER oder über composer herunterladen. großes Lob an Euch für die super Extension. Wir sind gerade dabei ein Projekt damit umzusetzen und hatten ursprünglich den Ansatz neben responsiven Bildern auch Lazyload zu verwenden. Allerdings zieht sich Lazyload seine Daten ursprünglich aus dem data-src und data-srcset Attribut. Seht ihr eine Möglichkeit, auch hierfür Eure Extension zu verwenden oder zu erweitern, sodass sie trotzdem pflegbar bleibt? zuerst mal danke für das Lob! Freut uns natürlich zu hören, dass die Extension gut ankommt. Als kurzfristige Lösung könntet ihr die beiden ViewHelper in einer eigenen Extension erweitern und den generierten Tag ($this->tag) vor der Ausgabe modifizieren. Natürlich freuen wir uns auch über einen Pull-Request auf GitHub, der die Extension entsprechend erweitert! Hey Simon, besten Dank für den Tipp! RWD images are set in this case by the viewport of the browser. Concering the size and dimensions of an image, this works fine if you have 1 col content. But building websites includes also 2 or 3 cols and here the element loads on destop view the max. size of an image. Due to the smaller cols, actually we only need maybe 600px width images for 2 col and even smaller once for 3 col. How you guys handle this problem? Actually in the backend there should be an option where editors can choose, which max size they need for this image if it embedded in cols. the key to solve this problem is to adjust the sizes attribute of the image tags. The first thing to do is to define a maximum width for tt_content images that is as big as the maximum image width in the primary column. This can be done by setting the TypoScript constant styles.content.textmedia.maxW. This in combination with the default sizes query of the extension limits the image sizes in the frontend. This setting will then be used in the Fluid templates to override the default sizes query for the left column. This is exactly what I was looking for, thanks! Thank you for your contribution. You have built a much-needed extension. Zurück Vorheriger Beitrag: How to GitHooks?